After playing music in 7 different countries and almost 4 months on the road I have returned home to Lincoln, Nebraska. It was a long but beautiful journey. I would like to thank all my European friends that hosted a house concert, gave me a place to stay for the night, or came to see me play while I was visiting. Hats off to you my friends! You will be missed. Now that I have finally returned home I will be playing several concerts in Nebraska so make sure to check the “tour dates” section for concert dates. I would also like you all to have my new EP “Love Isn’t What You Would Expect” for a pay what you want download above. I hope you enjoy it! Wherever or whoever you are, if you are reading this I wish you love and peace in this new year. Remember, Love never fails. 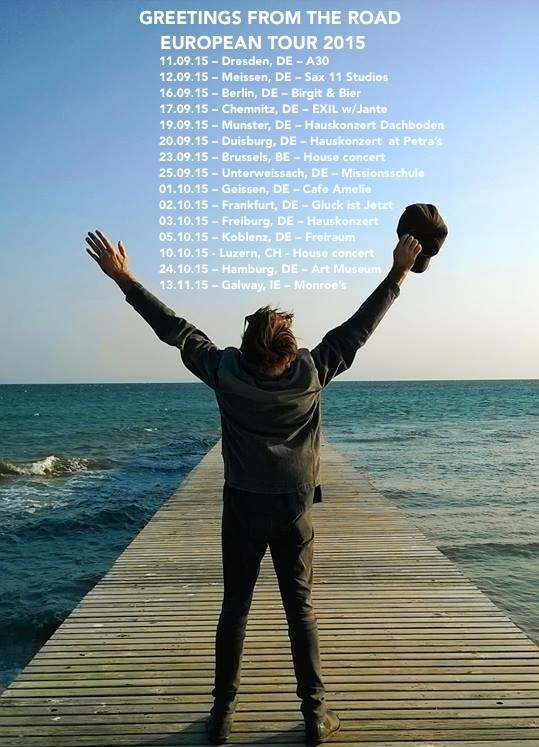 European Tour & New Music! I am returning to Europe to play house concerts and a few clubs along the way this September & October. I am excited to return again to Germany & Ireland! I hope to see a few new countries along the way this time and meet some new people as well. Check out the tour dates section for more details to see if I will be coming to your city. In other news, I just finished recording a new EP with producer Jonathan Jones (Waking Ashland, We Shot the Moon)! You can hear it on Bandcamp below. Enjoy friends! To my European friends, see you on the road!